Roy Gingrich has given us, in a most readable book, a solid introduction to and overview of the Ten Commandments. The opening pages the author devotes to introductory matters such as the recipients of the commandments, the date of the commandments, the names given to the commandments, the nature of the commandments, and the importance of the commandments. In the remainder of the book, Mr. Gingrich elaborates on each of the commandments, focusing on the subject of the commandment, the statement of the commandment, the meaning of the commandment, and the various ways the commandment is transgressed. 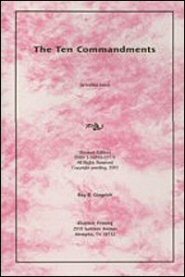 In a most enlightening section at the end of the book, the author deals with the present-day validity of the Ten Commandments; a discussion many will find most helpful.